This represents what was once my almost completed Giselle sweater. It was a good try but in the end it just wasn’t going to work for my body type. My biggest problem with the pattern was the ratio they used for the bust and arms of the sweater. I have a large bust but do not have the large arms that come with following the pattern as written. The sleeves were huge on me and there was just no fixing that, so I frogged it. I decided on making a top-down raglan sweater using The Incredible Custom Fit Raglan Sweater pattern. I cast on for a 24″ neck with 5 rounds of 1×1 rib and then a few short rows to bring the back up higher. I was going to go with an EZ EPS Sweater and got about 8 rounds of ribbing done before I found out I had twisted my stitches. I’m a bit afraid that I’ll run out of yarn on this one, so a top-down raglan would suit me better and it’s harder to twist 108 stitches (although I did manage to do it on the first try). The yarn is from School Products Yarn and is their Provence Lace Merino doubled and worked on size US size 8 (5.0mm) needles. I’m going to NYC probably the first weekend in March and I really want to have it finished by then so I can wear it on my trip when I visit the store and hopefully score another cone. 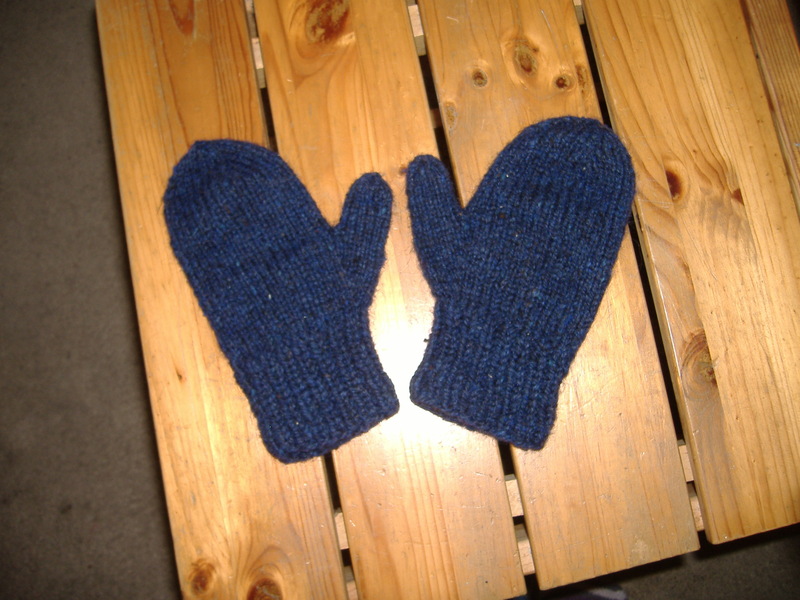 This is a pair of mittens I made for my youngest. 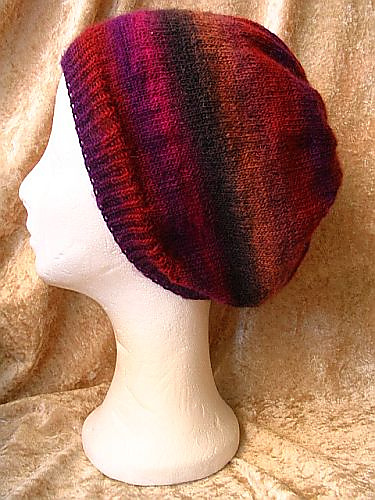 I used US size 6 (4.0mm) needles and Peace Fleece from stash. They are a little big on him (my own fault for winging them without a pattern), but he adores them and has asked me when I’m going to “needle” him a scarf to match them. I think I have some navy Caron Simply Soft in my stash somewhere or I may need to head to AC Moore to get him some or Paton’s Classic Wool so I can get it made for him. I finally kitchnered the toe on the second sock and finished my No Purl Monkey Socks tonight. I made the leg much longer than I normally do and it fits nicely. 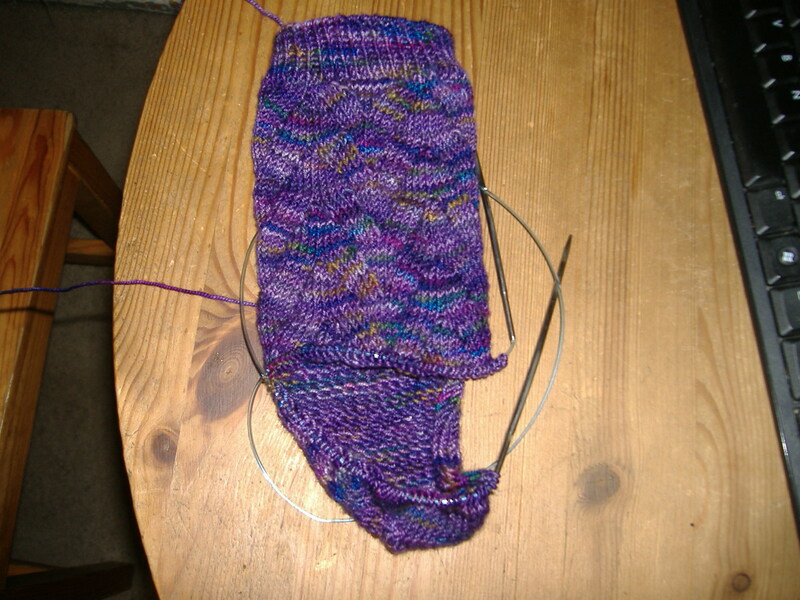 The foot of the sock is a little long because of the way the repeats worked out, but only by a bit. 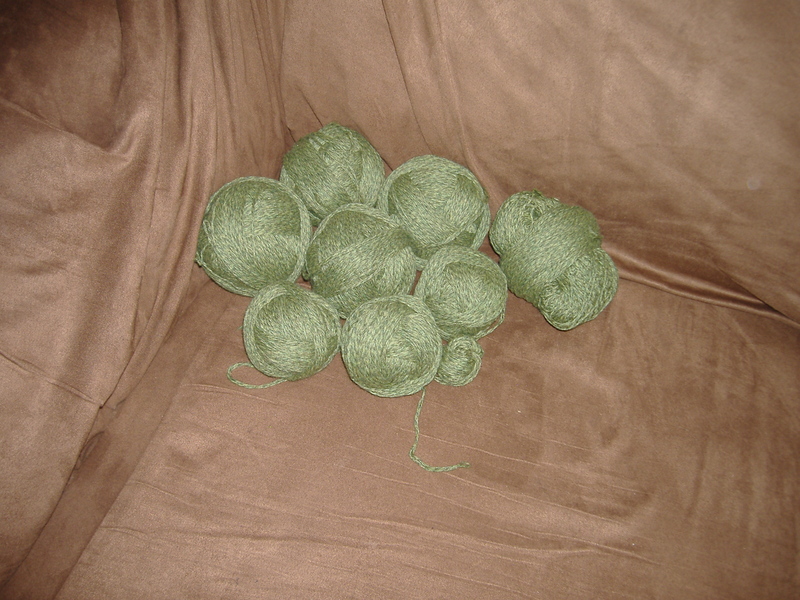 I should have finished these ages ago, but I haven’t been knitting as much as I should. 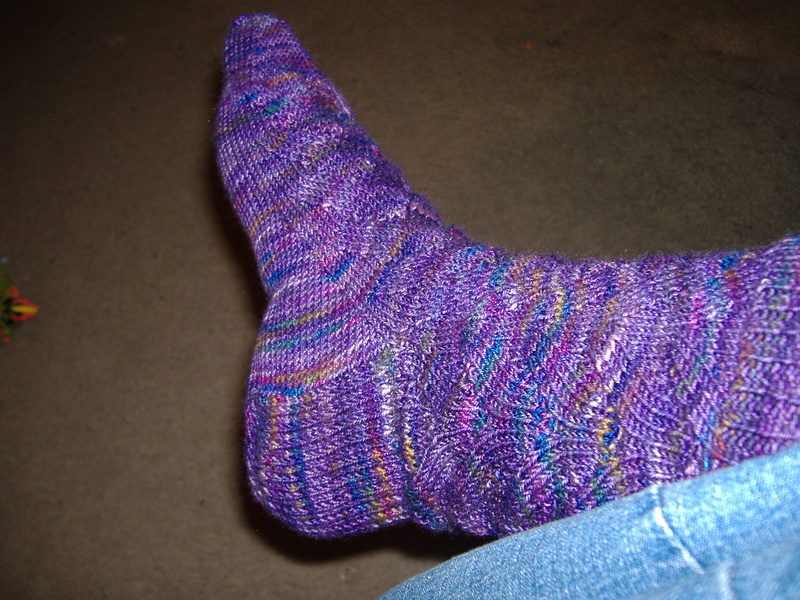 I used US size 2.5 (3.0mm) needles and Colinette Jitterbug 400 in Lilac. I made a mod to the chart by adding a stitch to either side of the chart and consequently adding two rows to the bottom of the chart. I’ll try to post the chart later this week. I just got this in the mail today and was very excited to read it. The beginning of the book has all sorts of technical information about different fibers and yarns and how they work in different patterns in the book. 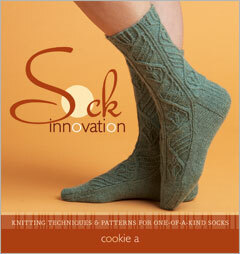 Some emphasis is placed on making your socks more durable through stitch and yarn choice. What it does not have is information about fit and adjusting your patterns which is what I thought it would contain. As written, there looks to be only a few patterns that I can use for my big, wide, high instep feet. There are several socks that I’d like to make from my quick perusal of the patterns, but as per usual I am going to have to do some heavy revisions to make socks that will actually fit my feet. Thankfully, I have my handy copy of Cookie A’s Sock Innovation which does have info on how to alter patterns to accommodate different sized feet. The chart she has on how to do a trapezoidal heel for any sized heel flap is priceless and one that I use all the time in my sock knitting. 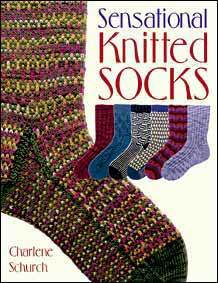 Sensational Knitted Socks is another good reference book as it has size charts for practically every sized foot available, and not just length but circumference as well for narrow, medium and wide feet. 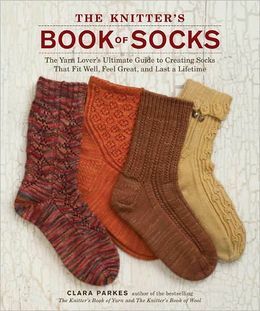 It has some nice things to say about sock structure and all of the patterns in the book can be altered to fit any sized foot. I look forward to reading the individual patterns more closely in The Knitter’s Guide to Socks but I have to say I’m not as excited about it as I though I’d be. It’s definitely worth having in your library, the designers she got for the book are fantastic, just don’t expect information about fit from it. In knitting news, I’m well on my way with my second No Purl Monkey sock, about an inch to go on the heel flap before I turn the heel. In an effort to keep the stitch pattern intact, the socks are a little bit longer than I usually like for my foot, so there’s not a nice, snug fit. I also made the cuff much longer than I normally do and it fits my large calves nicely, any higher and it would be too tight. I’m also working on mittens for my kids in some Peace Fleece and US Size 6 (4.0mm) needles. The youngest’s pair should be finished tomorrow and then I can get the measurements the older’s pair and hopefully have them done by the end of the week. I used a US Size 3 (3.25mm) 16″ circular needle and a US Size 2.5 (3.0mm) 40″ circular needle to work the pattern. I changed the cast on to 150 sts and the increase to 50 sts. I worked the rib for 15 rnds. 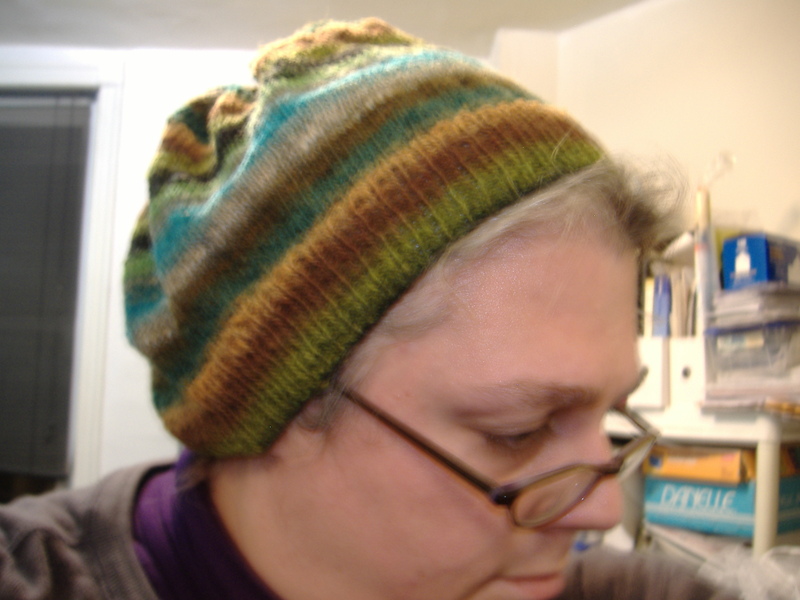 After the increase, I worked the body of the hat for 5″. I decreased first from 200 sts to 192 sts, k 2 rnds, then followed pattern decreases except only doing 2 rnds between decrease rnds. On final decrease rnd, I had 18 sts, so I did 3k2tog and 1k3tog on each needle (magic loop). If I were to make this again, I think I’d do the pattern as written but use size 2.5’s instead of my size 3. I definitely won’t be using Noro Kureyon Sock again since it just has no give and doesn’t lay well for this type of work. I’m really unhappy with the way the ribbing came out although some of that I have to chalk up to using Norwegian purling on a round or two which doesn’t play well with the Noro. I think I’m going to try it again but with a different tonal yarn as I’m not thrilled with the color of the yarn I used. All in all, it was a quick knit — I cast on on Friday and just finished it tonight without working on it every waking moment.